It seems to me that you are either a devoted fan of Eva Ibbotson, or not, and if you are a fan, generally, she gets the benefit of the doubt, even when her books get a tiny bit heavy-handed. Towards the end of her life, and wonderful career as a children’s book author par excellence, a few of her children’s books (like Island of the Aunts) focused on important environmental and social issues. To her credit, she held nothing back, feeling that the future generation had to be well-steeped in the illness of modern society, especially when it came to animals and environment. This children’s book, perhaps one of her last, takes on animal hunting directly, making it an abominable thing to do! 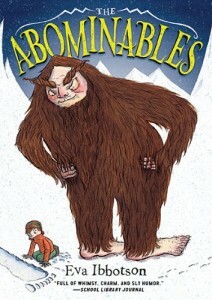 The story has a delightfully odd and wacky premise, of a young British girl who is raised by, and helps raise, a family of Yetis. The children’s book is filled with Eva’s terrific British humor, puns, and social satire. The plot is contrived and lovable, as are all the characters, until we meet the group of animal hunters, who of course in the end, do not succeed at doing anything harmful. There is a bit of tension in the book, but this is for 9 to 12, and I think most kids can easily handle drama. The ending of this book is superb. I love the courage that Eva Ibbotson demonstrated, both in her willingness to confront injustice head on in a children’s book, as well as her ability to create characters that are courageous and inspiring. For more books by Eva on this website, here’s a link to a search.